Objectives: Endometrial pathologies inside the cavity can occur simultaneously with gestational unpleasant consequences but are not always capable of being diagnosed by the hysterosalpingography (HSG). This study aimed to examine the value of performing diagnostic hysteroscopy beside diagnostic laparoscopy among infertile women with normal uterine cavities in HSG. 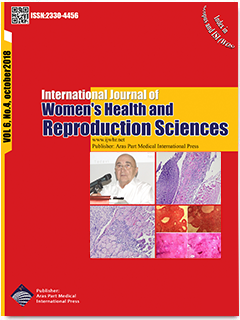 Materials and Methods: A total of 103 infertile women with normal uterine cavities in the HSG and within the age range of 18-40 who referred to Imam Reza hospital for laparoscopy during 2016-2017 were included in this cross-sectional study. Hysteroscopy was performed simultaneously with diagnostic laparoscopy. Then, the existence of uterine pathologies like endometrial polyps, submucous myoma, and uterine endometrial adhesions and their relationship with the patient’s age, infertility type and duration, and cycle time were evaluated. A P value less than 0.05 was considered statistically significant. Results: Overall, 64 patients (63.1 %) had a normal uterine cavity in the hysteroscopy while 39 of them had an abnormal uterine cavity, the HSG false negative cases of whom were reported 37.9%. The pathologies found in the hysteroscopy were endometrial polyp (16 cases), submucous myoma (1 case), uterine septum (6 cases), asherman syndrome (7 cases), bicornuate uterus (4 cases), polyp + asherman (3 cases), polyp + submucous myoma (1 case), and septum + submucous myoma (1 case). Patients’ age, type of infertility, and menstruation time during performing hysteroscopy made no particular difference in diagnosing pathologies of the uterine cavity in the hysteroscopy. Conclusions: Based on the findings, conducting hysteroscopy in infertile women who are candidates of laparoscopy and have normal uterine cavities in HSG can result in recognizing some cases of uterine pathologies which influence the outcomes of future pregnancies is not dependent upon the patient’s age, menstruation time, type and duration of infertility, and result of laparoscopy.